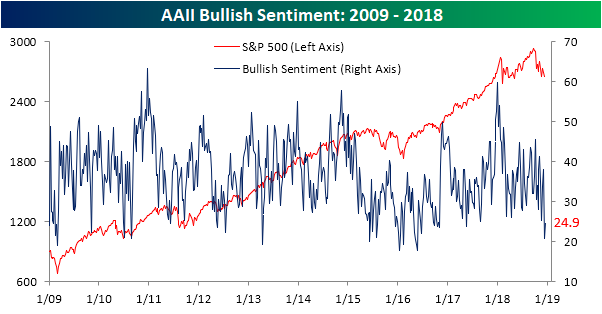 The survey of individual investor sentiment from AAII showed slightly more optimism this week with bullish sentiment coming in at just under 25%. That is a 4% jump from last week’s plunge to 20.9% taking equally from the bearish and neutral camp. Even with this increase, the results are not overly optimistic as bullish sentiment is still the minority opinion and at much lower than average levels. Last week’s reading was historically low, so it isn’t surprising that there was a small bounce. This week’s reading is also a divergence from price action in that time. On top of yesterday’s steep declines, markets have been broadly down since the last report alongside it being one of the worst Decembers to date, so an uptick—even a small one—is a bit of a surprise. If the current pace of market weakness continues, don’t expect the sentiment boost to last very long. Additionally, yesterday’s declines in the wake of the FOMC meeting are also likely to drain optimism. 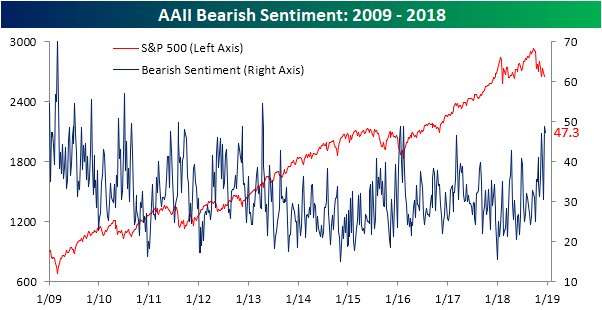 A near majority of investors are still pessimistic on the market as bearish sentiment remains at extremely elevated levels. Ignoring the prior week, this week’s reading of 47.3% bearish sentiment is still right at multi-year highs. In addition, and we have been seeing this a lot of late since the AAII survey closes on Wednesday nights, the full impact of Wednesday’s declines—especially late in the day like yesterday—can be reasoned to not fully come into play for the sample of surveyed investors. In other words, the damage done from Fed Chair Powell’s words likely weighed very lightly on this survey. Moving to next week, as scary of a thought as it may be, we could see yet another large rise in bearish sentiment to even more elevated levels if price action is similar to how it has been. Meanwhile, neutral sentiment came in a few points lower at 27.8% from last week’s 30.23%. Neutral sentiment still outweighs bullish sentiment which expresses a decent degree of uncertainty among individual investors.